I have to credit MLB Network Radio’s Casey Stern with that phrase, “Prospects are cool, parades are cooler.” I wish I coined it, but I think many of us know it from hearing Stern say it often on radio and TV. And as much as I love my prospects, predicting which ones are going to become future stars in the big leagues, and collecting many of their 1st Bowman baseball cards, in the end I’m all about my favorite team winning the World Series. That happened this year and I’m OK in the prospects price paid to claim a championship. I thought it would be an interesting exercise to take a look at all of the prospects the Boston Red Sox traded away over the last several years in building what eventually became a 2018 World Series championship roster. Oh indeed, some of these prospects are (were) cool, but that Rolling Rally and duck boats parade that attracted over a million people to celebrate that Boston dirty water – that was cooler! Santos is still only 19 and spent 2018 with Short Season-A Salem-Keizer in the Northwest League. In 12 games started he went 2-5, with a 4.53 ERA, 1.59 WHIP and 8.3 K/9. The 24-year-old Anderson started 24 games between Double-A Richmond and Triple-A Sacramento in 2018 and made the SiriusXM Futures Game in July. At one point he was ranked 13th in the Red Sox minor league system (our January 2017 Red Sox Top 50 prospects). What’s the problem? You don’t remember these guys? Sands was actually one of the returns Boston got in the big Beckett/Gonzalez/Crawford deal with the Dodgers back in August 2012. Boston in turn flipped Sands, De Jesus, Pimentel and Mark Melancon to Pittsburgh 4 months later in a deal for Joel Hanrahan and an up-and-coming infielder named Brock Holt. Sands is 31 and still toiling in the minors, splitting 2018 between Richmond and Sacramento in the Giants system. Pimentel was last with a major league organization in 2016 with the Mets AAA team in Las Vegas but was released that June. He pitched in 7 games for Guerreros de Oaxaca in the Mexican League that year but hasn’t pitched since. De Jesus, now 31, has been with a few organizations since that December 2012 deal with Pittsburgh. Most of his 228 MLB games were with Cincinnati in 2015-2016, and he was back in the Red Sox organization in 2018, playing 97 games for AAA Pawtucket but has recently elected free agency for 2019. As Kimbrel likely moves on to another team in free agency this offseason, despite his postseason inconsistencies and nail-biting inducing, late night playoff appearances, he recorded 108 saves (31, 35, 42) the last 3 seasons for Boston and was their bullpen anchor en route to winning the World Series. As a Sox fan I’ll take it and would do this trade all over again. The final net return for the Padres isn’t known yet, but some of the four have contributed at the MLB level and some are still on their way. Margot was the centerpiece prospect, at the time in Boston’s Top 10. Asuaje and Guerra were fringe Top 20-25, and Allen wasn’t quite on the top prospect radar yet having been drafted that year in the 8th round out of IMG Academy in Bradenton, FL. Margot made it to the majors in 2016 for San Diego and got into 10 games, then played in 267 games the last 2 years. He’s slashed .254/.300/.397/.697 with 20 HR and 30 SB in his 3 years in MLB. It looks like he’s a 4th/5th OF for the Padres in 2019 behind Hunter Renfroe, Franchy Cordero and Franmil Reyes. Guerra made his MLB debut in 2018, getting into 13 games for the Padres (going 2-16 at the plate). He’s still only 22, has reached AAA, but his stock has fallen some over the last couple years as there is another Padres minor league SS that some are ranking pretty high overall. You may have heard of Fernando Tatis Jr? Asuaje has quietly contributed at the MLB level, but he along with Cory Spangenberg aren’t going to see a lot of time once Luis Urias takes over 2B full time. Of all four, Allen may be the quiet sleeper from this trade. He really put it all together in 2018 and was one of our 2018 SP Prospect of the Year nominees. As a 21-year-old between AA/AAA he was 14-6 with a 2.54 ERA, 1.08 WHIP and 151 K in 148.2 IP. Once Boston’s #1 pitching prospect, Espinoza has been injured and when healthy hasn’t lived up to expectations… yet. He’s the former blue chip prospect the Sox parted with to bring on Pomeranz who was having an All-Star first half in 2016. Has this deal been a wash? Pomeranz has likely thrown his last pitch for Boston and he didn’t have a huge role in this year’s campaign. Following the trade in 2016, Espinoza pitched in 8 games for Fort Wayne in the Midwest League. He experienced forearm tightness in early 2017 and then was diagnosed with a torn UCL and underwent Tommy John Surgery and hasn’t pitched since. Is he still considered a top prospect in the Padres system? I bet you’ll get different answers from prospect evaluators and scouts across the board. I liked Espinal. Still do. I had him at #42 on my preseason Red Sox Top 50 prospects going into 2018. But what Dave Dombrowski did in June to bring to Boston who my boys call “Big Steve” was pure genius. Could Espinal become a future All-Star in the big leagues? Maybe? Probably not, especially with Richard Urena and Bo Bichette ahead of him on the SS depth chart, and very talented Kevin Smith and Logan Warmoth right behind him. What I can tell you is Boston doesn’t definitely win the World Series without Pearce. Espinal split his time between High-A (Salem, then Dunedin) and Double-A (New Hampshire), posting a .297 AVG and .800 OPS. This was another no brainer deal for Dombrowski. Give up a couple minor league arms for a rental to solidify 2B for the stretch run. Kinsler’s bat has slowed down and he didn’t have the success in Boston many hoped for, but his defense played and he picked up yet another Gold Glove. The Angels may get some quality return on this trade and I hope they do. Buttrey and Jerez seemed to be going nowhere in the Red Sox farm system. Buttrey had shown some solid improvements in the last couple years since being drafted in the 4th round back in 2012, but there was no MLB spot for him. He went on to close out some games for Los Angeles in September (4 saves in 6 opportunities) and is one of the arms in line for the Angels closer spot going into 2019. Jerez was also promoted to the Angels and pitched in 17 games, putting up a 6.00 ERA and 1.67 WHIP in 15 IP. I saw Jerez pitch in the 2017 Eastern League All-Star Classic for Portland but he’s another arm that just didn’t seem to have a path to the majors in Boston. Buttrey did K 74 in 49 IP in the minors in 2018. That’s impressive. Who? Kind of a stretch here but I wanted to be all inclusive. Yes, Boston signed Porcello to a multi-year contract after the trade, but initially this was the deal. Cespedes was a proven MLB All-Star at the time but Wilson and Speier were throw-in pitchers. At the time Wilson had pitched in 56 innings for Boston between 2013-2014. He was a middle innings RP and was not destined for late inning stardom with the Sox. In the 4 years since the deal he has seen at least 60 IP each season for the Tigers, has had a few chances to close (minimally) and I would call him an average major league relief pitcher. Speier was 19, having been drafted in the 19th round of the 2013 draft by Boston, with only Rookie ball experience at the time of the trade. Since then he’s been up and down between A ball and Double-A for Detroit, Arizona and Kansas City, having spent 2018 in AA (46 IP, all in relief). Of all the deals mentioned in this column, this is the blockbuster move to which many other deadline deals are measured. Superstar major leaguer goes to a contender for a big chunk of farm system top talent going to the rebuilding team. I had already invested in Red Sox Moncada jerseys and Kopech autographed baseball cards as they were a couple of the next big things to come. 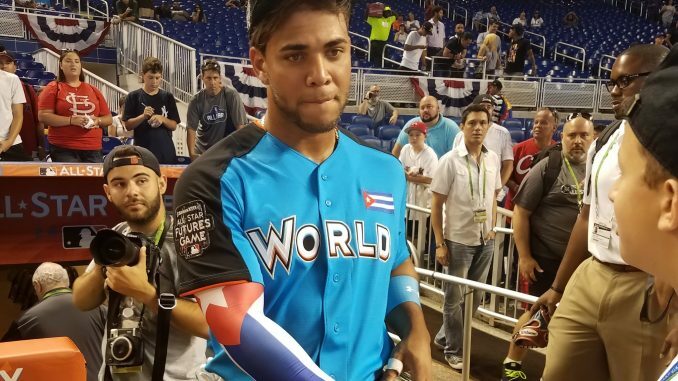 Moncada was the #1 overall prospect in some circles. Kopech’s 100+ MPH stuff was the stuff Boston was excited to bring to Fenway in the near future. This is the type of trade that kills you as a prospect lover and follower of a certain team, but at the same time it also brings a frontline ace and All-Star LHP and dreams of postseason glory. I bought in. It will probably be several years until the White Sox can garner their full return for Sale. Moncada is Chicago’s starting 2B and leadoff hitter. He hasn’t quite lived up to the potential, hitting .235 with an OPS of .714 in 2018, although he did hit 17 HR with 61 RBI. Unfortunately he led the AL in strikeouts with 217. Not what you want from a leadoff hitter. Kopech debuted in Chicago this past season, logging only 14.1 MLB innings with mixed results, but he’s on the shelf now with TJS and is not expected to pitch in 2019. Basabe is a 22-year-old toolsy OF coming off a 2018 season in which he played in the Futures Game and smashed a 102.3 MPH fastball from Cincinnati’s Hunter Greene out of the park. Expect Basabe to spend most of 2019 in AAA. Diaz is a hard throwing Dominican who didn’t pitch in 2018 because of lingering shoulder issues and had struggled in his limited innings in 2017. He’s 24 and hasn’t pitched above High-A Winston-Salem so the clock is ticking on him. This is the one trade in recent memory that has not panned out well for Boston. Thornburg has done virtually nothing for Boston, having missed the entire 2017 season due to injury and logged only 24.1 innings in 2018, posting a 5.63 ERA and 1.58 WHIP. He’s 3rd year arbitration eligible in 2019 and will be a free agent in 2020, so Sox fans will have to put up with his soap opera for another year. On the other hand, Shaw immediately blossomed into a very good everyday player for the Brewers, hitting 31 HR with 101 RBI in 2017, plus another 32 HR this past season with added positional flexibility at 1B, 2B and 3B. Dubon was pretty much blocked at SS in Boston (Bogaerts) so going to Milwaukee was good for his career. He split time between AA and AAA in 2017 but missed most of 2018 (only played in 27 games) after tearing his ACL in May. Pennington was a 29th round pick for Boston in 2014 and had pitched well in the minors in 2015-2016, but after dealing with arm injuries in 2017 and early 2018, he announced his retirement this past May. Coca was the “player to be named later” in this 4-for-1 deal and spent 2018 in Rookie ball (Helena) in the Pioneer League. Wow, Lars Freaking Anderson! A blast from the past! Back in 2012 the Sox dealt Anderson, who was once one of their top prospects (John Sickels had him ranked #1 in Boston’s system going into 2009), to the Indians for Wright. The knuckleballer has been up and down for Boston over the last several years, but he’s been solid for the most part, in addition to being hurt and suspended. Anderson, now 31, has only seen 56 at-bats in the bigs – all with Boston back in 2010-2012. He’s since been in the Indians, Cubs and Dodgers systems and most recently played for Sydney in the Australian Baseball League in 2017. He did not play in 2018. Smith was in 18 games for Boston this year. Try 8 games in 2017 and only 3 in 2016, this after a stellar 2015 with Seattle. He has not had any impact in Boston although he earns a World Series ring this year. Do we remember Aro? He had only pitched in 6 games for Boston (10.1 IP) in 2015 before the trade that December. He followed that up with 1 game (0.2 IP) in 2016 for the Mariners and that was the last time he pitched in the majors. Aro spent all of 2017 in AAA for Seattle and all of 2018 in AAA for San Diego. He’s now 28. #RedSoxNation won’t care one iota if Beeks goes on in 2019 to win consecutive Cy Youngs for the Rays (after Blake Snell takes the award this year) because it would’ve all been worth it. Eovaldi is now a folk hero in Boston and all around New England following his dominant 2018 postseason. Nobody will soon forget the 97 pitch relief appearance in Game 3 of the World Series. Does anyone even remember that he was the losing pitcher in the 18th inning? It doesn’t matter. Dombrowski took a chance on a 28-year-old arm that has been through two Tommy John surgeries. And like the Pearce deal, it paid off. Eovaldi is a free agent and may not be back in Boston as he impressed on the biggest stage and many teams will be interested this offseason. On the other hand, Beeks reached the majors in 2018, getting in 2 games for Boston (1 GS) before the trade and 12 with Tampa Bay. He struggled in his first big league action posting a 5.51 ERA, 1.50 WHIP and a 7.5 K/9, down from 12.1 in the minors with Triple-A Pawtucket. The 2018 Red Sox roster was made up of homegrown talent, stars signed through free agency, and others strategically acquired via the trade market. This theme of trading prospects for proven talent worked in the long run for Boston as another World Series trophy now sits in Fenway Park. It will be interesting to follow other teams that follow this model in hopes of cashing in on top MiLB players. In the end, prospects are really cool (especially for those of us who participate in deep dynasty fantasy baseball leagues!) but give me a World Series parade and I’ll take that ten times out of ten.